At Magnolia Boutique, we love Halloween so much, we want it to last all year. Unfortunately, you can’t wear your costume everywhere. To help you channel your favorite costumed character anytime, anywhere, we took DisneyBounding to the next level with our simple Halloween costumes that suggest the look and feel of your costume — without going overboard. Check out some Halloween inspired costumes that you can wear any day in October! This Halloween, be everyone’s favorite hero or the villain they love to hate. Look at some of these easy Halloween costume ideas that have all the thrill and daring spirit of your favorite superhumans, without splurging for a full-on costume. 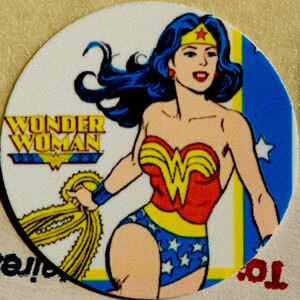 Bring Wonder Woman to life for this simple Halloween costume with a red top and blue bottoms. Keep channelling her indomitable spirit with some knee high heels and plenty of gold accent jewelry. Throughout comic and movie history there have been many variations of Wonder Woman’s outfit, so you can create your own twist on this classic character! Suicide Squad wasn’t the biggest hit in theaters, but it did introduce us to some cool new anti-heroes like Katana and Harley Quinn. Take on some of Katana’s badness with a moto jacket, black pants, a white crop top, a red scarf for your waist, and some lace up converse. If you want to take it a step farther, draw a red circle on a masquerade half mask and tote around a katana style sword. This may not be a super easy halloween costume, it’s definitely worth the extra effort. Get that made-for-TV look in your wardrobe by emulating one of your favorite television and Netflix series cast of characters. With so many options to choose from, the opportunities here are endless. Here are a couple of simple Halloween costume ideas to get you started. This costume is very easy to recreate! All you need is a pink dress, denim jacket, tube socks, and lace up boots. Top your outfit off with a wig or a box of Eggo waffles when you’re ready to go out! While this show is a real throwback, many people can’t get enough of Wednesday Addams. For her outfit, choose Puritan inspired outfits like black high neck dresses, or something with white polka dots. Braid your hair to complete the look! Wish upon a star, don’t wish you had more money. Ditch the expensive and overly-elaborate Disney princess gowns for items that you can wear year-round. Choose from any number of the beloved set of characters and live out your dreams. For a classic green and purple combo, skip the tail and choose green skinny jeans and a orchid sweater. If you don’t have red hair, you can tint it with vegetable dye that washes out easily. Add a fork as a hair ornament for a playful twist. Every bookworm’s favorite princess, Belle can bring a little more beauty for your every day outfit. Start this simple Halloween costume with a white blouse and add a blue skirt for her small town look. Then just tie your hair back with a bow and carry around your fave book. Combining pieces of your wardrobe together can result in a unique expression and interpretation of each Halloween costume. Using your clothes to create a simple Halloween costume means you get to rock your look all year round. Don’t have the pieces you’re looking for? Shop Magnolia Boutique for the finishing touch to your outfit!